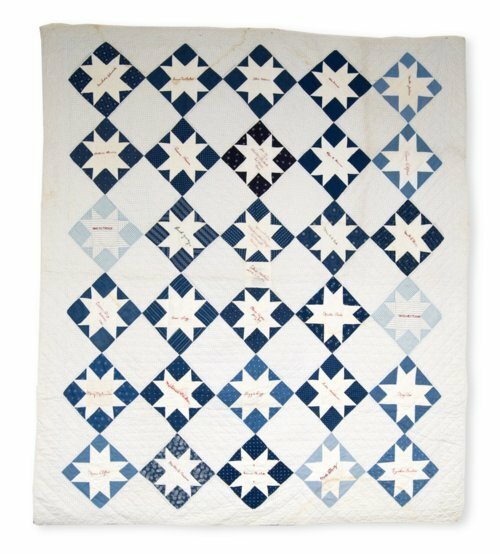 Blue and white cotton friendship quilt pieced in Saw Tooth pattern, also known as Evening Star. Signatures are embroidered in red at the center of each block, several of which include the year 1914. The latest dated block on the quilt is from 1916, and was appliquéd later at the center. The quilt maker was Winnie Emma Chambers. She collected the embroidered signatures from friends and neighbors living in Allen County near the towns of LaHarpe and Iola. Mrs. Chambers may have requested the signatures because her family was moving to Arizona. Her own name also is embroidered on the quilt.